Prati is a leader in the label finishing industry at a global level. Centred on innovation, quality and lifelong reliability. Ultimate flexibility in a compact, modular, multiuse platform for SA labels, clear-on-clear labels, cardboard, IML and flexible packaging. 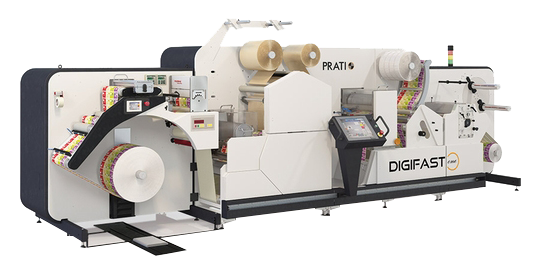 The Digifast One is Prati’s top of the range digital finishing solution, offering a modular platform that enables label converters to configure the machine to suit their embellishing needs. The ultimate, versatile finishing line for In-Mould and wet glue labels with an unwinder diameter of up to 1040mm.